Want to avoid this? Photo courtesy of BSA. Decks seem to be the easiest structure there is to build. Continuing failures, sometimes fatal, show that they are very complex and require great attention to detail. 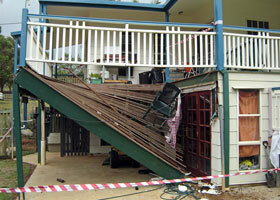 An Archicentre press release claims there were about 8,000 life-threatening decks in Australia. Don't let yours be one of them. Enquire about our LifePlus® Decking Guide and follow it to the letter and you will end up with a safe deck with a long life. Minor deviations can have serious consequences. Timber decking has experienced a resurgence in popularity in new home construction together with adding decks to an existing high set homes. There are a number of important design considerations in using timber. This easy-to-read article explores the timber decking issues and how to deal with them. Deckwood Selection Guide: This 12 page Deckwood Selection Guide covers deckwood profile and specifications, span loadings, fixings, timber finishes, and maintenance as well as engineering data. Order hard copies Hard copy versions are available for $10.00 ($AUD) + $5.00 ($AUD) Postage and Handling, each per copy. How should pool-side timber decking be maintained to maximise its life-span?